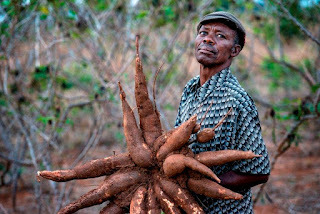 Cassava is a perennial woody shrub with an edible root, which grows in tropical and subtropical areas of the world. Although history dates its origin to tropical America and is believed to have been introduced into Africa in the Congo Basin by the Portuguese around the year 1558, Africa has become the largest producer of the crop today. Currently, Nigeria is the largest producer of cassava in the world with over 54 million metric tonnes yearly. Statistics made available by the International Institute of Tropical Agriculture (IITA), which has made cassava its main focus, states that nearly every person in Africa consumes around 80 kilograms of cassava per year, which accounts for 37% of our dietary energy, thus making it quite an important crop. Apart from the fact that cassava can be processed into various by-products, nearly every part of the cassava plant can be used in some way. Other than the starchy roots of cassava shrubs, the leaves and stems of cassava can also be used to make food for both humans and animals. In Nigeria, cassava is a crop for all. Its leaves are used in making soups, stews and livestock feed. The stems – which are the means of propagation of the crops, can also help to increase mushroom growing, used to make firewood for heating. It will surprise you that a quarter-cup serving of cassava flour has about 114 calories, 2 grams of fiber, less than 1 gram of fat, protein or sugar, 28 grams of carbohydrates and about 17 percent of daily Vitamin C.
In most cases, cassava flour works well when you use it in the same proportion as wheat flour – in yeast-based recipes (like most bread, for example) a percentage of cassava flour makes for incredibly excellent results. Cassava can be used in making flour which is important in the recipes for cassava bread, cakes, chin-chin, biscuits, pizza, brownies, and so on. These qualities, along with the fact that it can be replaced on a 1:1 basis with wheat flour in many recipes, makes it preferred flour for gluten-free, grain-free baking and cooking. Cassava can become Africa’s new cash crop that has the potential of feeding the world. The crop is abundant in the continent, easy to cultivate and could be an ideal crop to improve the food security for millions of people worldwide. Why is Africa not exploiting this crop? Why are we not promoting it to the world for export? It is high time Africa started planning for the future and exploiting potential opportunities that would place us on the world map for good! We can solve world hunger and be a major producer of a product that can achieve this. What is holding us back?